Dutch Patronymics: Confusing or Helpful? How can a man with the surname Mackelyck have sons with the surname Woglom? Because of Dutch patronymics, it’s not only possible, it happened. The most common Dutch naming custom in New Netherland (present day New York) pre 1687 was that of patronymics, or identification of an individual based on the father's name. In 17th century New Netherland Pieter Adrianszen (using the patronymic Adrianszen meaning son of Adrian) had the nickname of Soo Gemackelyck (translation: so easy-going). But he was also known as Pieter Van Waggelen with variant spelling Van Woggelum. When patronymics ended in 1687 under English rule his children adopted different surnames. Some took Mackelyck, based on his nickname) and others took Woglom (based on his place of origin name). But what are patronymics and how are they formed? Jan Albertszen as an example, is named after his father Albert. Albertszen means son of a man named Albert. The patronymic was formed by adding -se, -sen, or -szen. Daughters would very often have the ending -x or -dr. added. For example, Geesjie Barentsdr. (Barentsdochter) is named after her father Barent. An individual could also be known by his place of origin. For example, Cornelis Antoniszen, my ninth great- grandfather, was known in some records as 'van Breuckelen', meaning 'from Breuckelen' (Breuckelen being a town in the Netherlands). The place-origin name could be a nationality, as in the case of Albert Andriessen from Norway and my ninth great-grandfather, originator of the Bradt and Vanderzee families. He is found in many records as Albert Andriessen de Noorman, meaning the Norseman. An individual might be known by a personal characteristic: e.g. Vrooman means a pious or wise man; Krom means bent or crippled; De Witt means the white one. Sometimes an occupation became an individual’s surname. Smit=Smith; Schenck= cupbearer, Metsalaer= mason. An individual might be known by many different 'surnames' and entered in official records under these different names, making research difficult unless you're aware of the names in use. There are tremendous variations in spelling of these names, and changes from Dutch to to English record keeping in the New World affected the spelling even more. The English found the Dutch naming system of patronymics confusing and could not easily identify one family unit. Thus they ordered that all inhabitants must choose one surname to be used by everyone in that family. The use of patronymics in New York ended theoretically under English rule in 1687 with the advent of surnames, but not everyone followed the new guidelines. For example, Albert Andriessen de Noorman's sons and daughters took the surname Bradt except for his son Storm. Storm was born on the Atlantic Ocean during the family's sailing to the New World and he adopted the surname Van Der Zee (from the sea) which is the surname his descendants carry. Another thing to look for in searching the early records is to be aware of the different ways names might be pronounced in different areas, or how clerks might write them down. For example, a boy might be registered as Jan "Kiek in 't Veld", and his father would sign with "Kijk in het Veld". "Kiek in't Veld" is how it is said in the eastern dialect, "Kijk in het Veld" is how it is said in proper Dutch. The father could write down it properly, but he couldn't say it properly. The clerk at that time may have come from the West and just wrote down what he heard without translating it. If you were searching such a family, you would have to look for both lines. New Netherland Naming Systems and Customs, by Kenn Stryker-Rodda, published in The New York Genealogical and Biographical Record, volume 126, number 1, January 1995, pages 35-45. NOTE: A footnote states that the text is a talk that Dr. Stryker-Rodda gave at thye World Conference on Records and Genealogical Seminar held in Salt Lake City 5-8 August 1969, and it was originally published in the papers of that Conference, Area 1-27. The original talk was copyrighted in 1969 by The Church of Jesus Christ of Latter-day Saints. Learn more about doing Dutch genealogy by watching "Researching Your Dutch Ancestors" in the Legacy Family Tree Webinar library. The biggest in-person genealogy event of the year begins next week - and Legacy Family Tree will be there front and center! RootsTech 2016 is scheduled for February 3-6, 2016 in the Salt Palace in Salt Lake City, Utah. Read all about it at www.rootstech.org. Oh, and we'll have our conference-special pricing on Legacy products too! For as long as they last, everyone who stops by our booth can take home a free webinar CD from our library (one per attendee please). Come quickly to pick up your favorite class before it's gone. Meet Thomas MacEntee - in person! at our booth Saturday morning from 10-11am. This is your chance to have your book or webinar CD signed, take a picture, or just mingle with one of your favorite genealogy gurus. Got digital images? Get an in-depth look into Google's new photo service - Google Photos. Learn best practices for managing, sharing, searching, enhancing, and preserving your digital photos. Learn how to access your collections via your computer, smart phone, or tablet. Right around the corner is the world's biggest family history library so if you don't see me at the booth, in class, or at lunch - guess where I'll be? Hope to see you all there! If you research North Carolina or Virginia ancestors, you will not find it unusual to track your ancestors to Tennessee. Do you know the best resources and sites to research your Tennessee ancestors? Just as you would with any other new location you are researching, learn about the county and state where your ancestors lived. Research the county and state lines and any boundary changes that may have occurred during the pertinent time period. Refer to this interactive map of Tennessee’s evolving county borders. The Tennessee State Library and Archives is a natural place to start your Tennessee genealogy research. You will find a variety of resource guides and online digital collections. Examples include Searching for Your Ancestors at the Tennessee State Library and Archives, Early NC/Tennessee Land Grants, and African American Genealogical Resources. Be sure and check the Family Bible project and the historic Tennessee map collection, too. Take time to explore the Tennessee State Library and Archive’s website as you begin researching your Tennessee ancestors. Another great resource for Tennessee residents is the genealogy tab at the Tennessee Electronic Library. You will need to provide Tennessee zip code and phone number to gain access. Initially, part of today’s Tennessee’s eastern counties were part of North Carolina. In 1784, North Carolina ceded part of their western lands to the federal government, but set aside land for land grants to Revolutionary War veterans. Land grants for these counties can be found in the State Archives of North Carolina. Once Tennessee became the 16th state, the county records for those previously North Carolina counties stayed with the county seats. A few early records for these counties were retained in North Carolina. Refer to the Records relating to Tennessee in the North Carolina State Archives document for a listing of these records. For a more detailed explanation of the formation of modern day Tennessee including the State of Franklin, go to the Tennessee State Library and Archives. Be sure to visit individual counties genealogical and historical societies. This list is not meant to be exhaustive, but a starting point for the researcher with Tennessee ancestors. What are YOUR favorite Tennessee genealogy resources? Tell us in the comments! 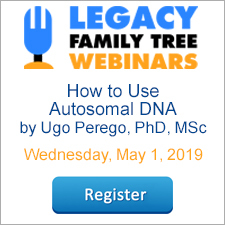 The recording of today's webinar, "The Paper-Less Genealogist" by Denise May Levenick PLUS the after-webinar party is now available to view for free for a limited time at www.FamilyTreeWebinars.com. If you could not make it to the live event or just want to watch it again, the 1 hour 48 minute recording of "The Paper-Less Genealogist" is now available to view in our webinar library for free for a limited time. Or watch it at your convenience with an annual or monthly webinar membership. 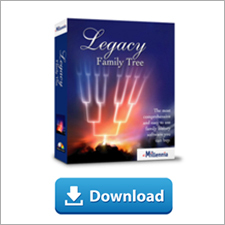 Use webinar coupon code - paper - for 10% off anything at www.FamilyTreeWebinars.com or www.LegacyFamilyTreeStore.com, valid through Monday, February 1, 2016. How can blogging help your family history? I entered the blogging world well before it had entered the mainstream lexicon. Back then, I only had a vague idea of what blogs were and certainly no idea as to their usefulness as a tool in our social network. For me, it was a way to demonstrate to myself and my teachers, what I had done as a product. As a senior in high school, we were required to complete a year-long independent project and I set out to learn about my family history and the world of genealogy. At the same time, I learned about the world of blogging and would like to offer some reasons blogging about your family history can enhance your overall experience in genealogy, no matter what level of involvement in the field you decide to take. I’m always impressed by the diversity of blogs I encounter and can truly say that having a blog can make family history a lot more fun. It allows you to be creative and to bring the stories of your ancestors to life. Often times, genealogy blogs are focused around one’s family tree or themes like technology or study projects related to a historical community. One of my favorite parts of posting is to add pictures of ancestors, historical buildings, and more as an aid for blogging about events in my ancestor’s lives or to capture my reflections on experiences like research trips. I wouldn’t say it’s permissible to be opinionated to the point of being offensive, but it is valuable, if not equally important to share how you perceive the events and decisions of your ancestors. After finding a clue, you might realize that it relates to something you heard from relative long ago. Research skills and knowledge are essential, but equally important is allowing our minds to open up and think about the research in a new, perhaps more person way. World map showing breakdown of visitors to my blog by country. "Stats for 2016 < Travelogues of a Genealogist," Wordpress.com. Accessed 20 Jan 2016. It’s always a treat when a relative you never knew before writes to you with new genealogical evidence to corroborate with yours. That’s happened quite a few times over the years because having my blog allowed them to connect with me. I’ve received e-mails from cousins living California to Galway, Ireland and more. By keeping a blog about certain lines of your family that you are pursuing, there is likely someone out there researching the same line. Bloggers can tag their posts with different subjects such as locations and surnames which can help blogs reach the desired audience based on their content Admittedly, I do feel bad when individuals researching Fletcher e-mail me. My connection to Fletcher resulted in a paternal name change by my grandfather, so I have nothing to offer. You can use your blog to document your research process. In my own blog, I devote posts to clues or several clues found simultaneously in a case study. I then talk about the sources, their origin and purpose, and then I talk about how does the source corroborate with other evidence I have previously collected. As I blog consistently about my ancestors, I simultaneously am creating the backbone of content like articles and presentations. I knew that after seven years of posting on my genealogy blog, I’d be devastated to lose all that information. All blog hosts offer a backup service, but you might also consider having your blog turned into a book. The process is quite simple if you convert your blog into a pdf. Blog2print.com offers this conversion for a small charge. To print the actual book, I placed my order through lulu.com for the same price. Having a print copy of my book, I have re-purposed my blog as a reference source on my bookshelf so I can utilize in ongoing case studies for my own family. It also offers a new way to share my work with other family members. If you haven’t already started blogging about your family history, consider trying it. The most popular hosts are Blogger and WordPress, both of which are free. Blogging is very accessible and can be done at your leisure, but you find yourself posting more than you thought. Blogs are an invaluable asset for genealogical research! Jake Fletcher is a genealogist and blogger. Jake has been researching and writing about genealogy since 2008 on his research blog Travelogues of a Genealogist. He currently volunteers as a research assistant at the National Archives in Waltham, Massachusetts and is Vice President of the New England Association of Professional Genealogists (NEAPG). View the January 21 release notes here.